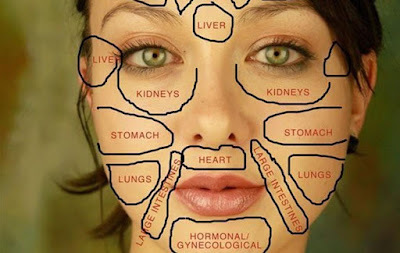 Your face can tell a lot about your health, particularly about the condition of your organs. Our facial skin is very sensitive and can react to any issues that happen within the body. So, any changes in the color, appearance, or texture of the skin could indicate that a particular organ isn’t functioning properly. Therefore, continue reading if you want to find out what your face is trying to tell you, and how you can treat that issue. If you notice something on your nose, it means that you have poor circulation, hypertension, flatulence, bloating, or you are exposed to pollution. You should detox your body by drinking plenty of green tea and staying active. If you eat a lot of sugar, canned foods, drink a lot of alcohol, and are under stress, you may experience problems on your forehead. So, you should keep yourself hydrated and get enough sleep. Avoid drinking alcohol, and include more fruits and veggies in your diet. When your body becomes dehydrated it can also cause hormonal imbalance. Also, if you eat a lot of salt, seasoned food, or drink a lot of coffee, you will get the same effect. So, stay away from these things if you don’t want to have further issues. If the hormonal imbalance is hereditary, this won’t be enough. Your liver will not be able to function properly if the stomach is overburdened. Therefore, you should include more healthy foods so you can boost your digestive system, and try to stay more active. If you have poor blood circulation, weak heart muscles, you smoke, or you drink too much alcohol, you may have problems in this area. Avoid smoking and drinking, and stay hydrated so your kidneys can function properly. You can have problems with your stomach if you consume a lot of fat, alcohol, sugar, or coffee. Spicy foods and having stressful situations can also have the same effects on your health. Therefore, you should include more fruits in your diet and have a healthy and balanced everyday diet. You should stay away from stressful situations and surround yourself with people who bring positive energy. If you eat too much sugar, you smoke, and you are under stress, you are causing problems for the lungs and kidneys. Keep your body hydrated all the time and eat more healthy foods. If you are exposed to air pollution or you smoke you may have lung issues. Therefore, avoid polluted areas and places where people smoke.